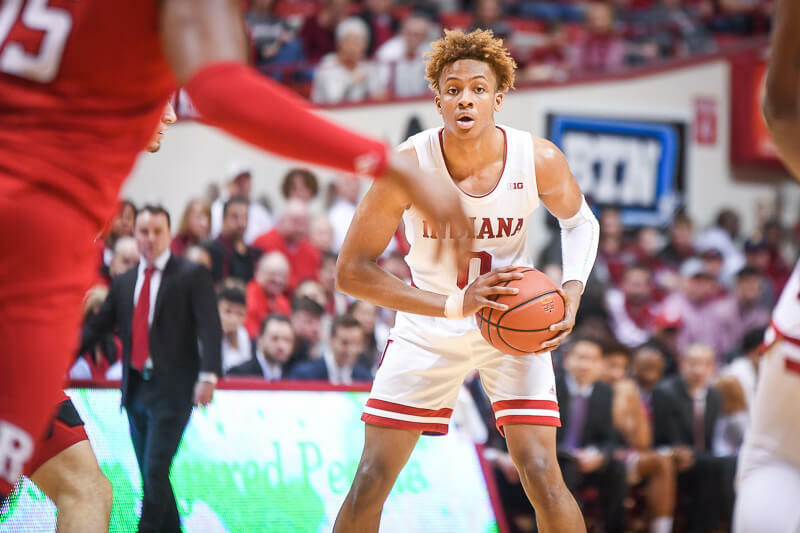 Indiana bounced back from Friday’s disappointing 90-69 loss to Indiana State with an 86-77 win over Howard on Sunday evening at Simon Skjodt Assembly Hall. 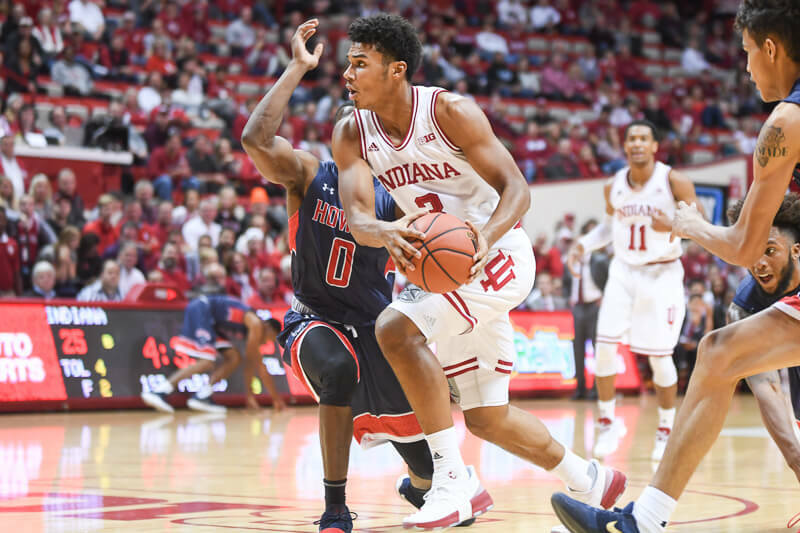 · Freshmen take a step forward: All three of Indiana’s freshmen played in Sunday’s win, including heavy minutes off the bench by Al Durham Jr. and Justin Smith. Durham came off the bench and shot 5-of-9 from the field, including a 3-of-5 performance from behind the 3-point line. The Georgia native finished with 16 points in 30 minutes. Smith, meanwhile, saw his minutes increase after Juwan Morgan went down with an ankle injury early in the game. The versatile 6-foot-7 forward had a double-double – 16 points and 12 rebounds – in 27 minutes. Clifton Moore also played six minutes and had two blocked shots. 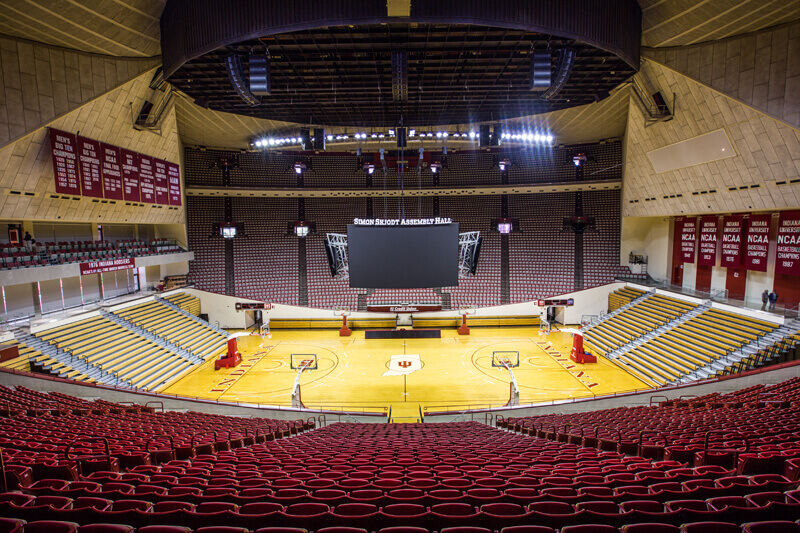 · Poor free throw shooting makes things interesting: The Hoosiers allowed Howard to stay within striking distance all game and poor free throw shooting was one of the main culprits. Indiana was just 12-of-29 from the free throw line and there were poor performances all over the roster. De’Ron Davis, who scored a team-high 17 points, was 3-of-10 from the line. Robert Johnson was just 2-of-6. And Freddie McSwain missed all four of his attempts. Through two games, Indiana is 23rd nationally in free throw rate (FTA/FGA) according to Ken Pomeroy, but is shooting just 56.5 from the line. For a team that is going to have its challenges offensively, the free throw shooting must improve in a hurry. · Davis dominates in the paint: As mentioned above, Davis finished with a team-high 17 points and was very efficient besides the free throws. Davis was 7-of-9 from the field and also had six rebounds, three assists, three blocks and no turnovers in 29 minutes. Not only did he play turnover free, Davis didn’t commit a foul. · Another 3-point barrage on the defense: Indiana State made an Assembly Hall opponent record 17 3-pointers in Friday’s stunning victory and Howard followed it up with 13 treys of their own. Through two games, Indiana has allowed its opponents to make 30 3-pointers at a 50 percent clip. Some of the shots Indiana State and Howard made over the weekend were ridiculous heaves, but they also had plenty of open looks due to breakdowns from Indiana’s defense. 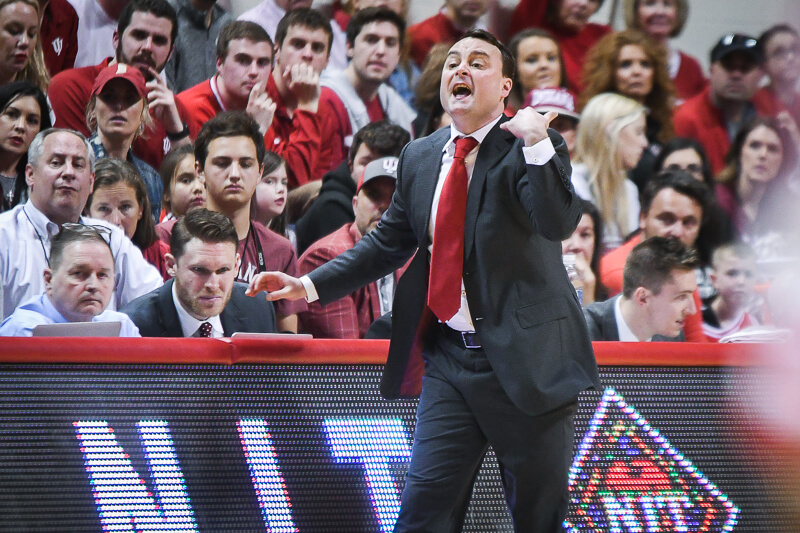 · This is a team still searching for its confidence: Friday’s loss knocked Indiana back on its heels and on Sunday, the Hoosiers looked “shellshocked” at times, according to Miller. That’s not to say Indiana didn’t do some good things on Sunday, but with all of the returnees adjusting to a new system, the on-floor leadership is lacking from an execution standpoint. Right now, many of IU’s freshmen have the upper hand on the upperclassmen because they’re not trying to break away from old habits. I’m not sure the evidence at this point suggests the talent we have is as good or better than Vandy last season. Maybe recruiting rankings would tell us otherwise if someone wanted to look that up? I’m sweating the free throws. That is a purely mental and repetition thing. It takes almost no effort or time to practice free throws and can be done anywhere with a hoop and ball. Inexcusable for one guy to shoot that poorly let alone the majority of a team. Watch a replay of the game. I think you’ll change your assessment of Johnson’s performance last night, particularly defensively. It was mostly Newkirk and Green whose defensive lapses hurt the team last night. RoJo posted a stat line of 7-2-2 along with 4 TOs in 36 minutes against a mediocre at best ISU team. He certainly played better against a sub 300 BPI team in Howard, but there’s no question he seems to have lost the confidence and assertiveness we have seen out of him, especially during his sophomore year. As the only four year starter on this team, RoJo more or less is thrust into an on-court leadership role. I am more expressing a little bit of frustration that he hasn’t developed into a top 10 or 15 player in the Big10 like most of us expected he would…. They will get there. I’d rather they spent their time on learning to anticipate the close outs right now. I’m sure they will. But free throws are literally free points. Points needed to win games. Especially necessary if you don’t play great defense… Shouldn’t be ignored. So it is really question of how quickly and how that talent can become acclimated into the new philosophy under your premise. Right? While I’m hopeful of a turn around so far our two senior guards have not only not led the change but are really acting like impediments. I’ve been so disappointed. Without RJ AND JN stepping up, this really becomes a different season from the one I was hoping for. I think it’s a lot more mental than the reps. I think the guys are putting in the work. It’s kind of fluky. It was 3 guys missing–DD, RJ, and FM. Freddie probably isn’t ever going to be great at it. DD played well otherwise, so I think it was a fluke. RJ started playing a bit better in the 2nd half but his head is still in the funk like late last year seemingly. I’m with you. I just think FT aren’t foundational like some of the other things being put in place right now. I would guess DD (and FM) are spending a lot less time practicing long jumpers this year and FT Pct for our bigs might temporarily dip as a result. Nothing can explain RJ right now. What occurs to me about it all is how angry fans get when a player isn’t what they think he SHOULD be. I’ve been writing about a similar dynamic regarding RJ lately. Once an expectation has been created by the media, by recruiting services, and the fans themselves, anything less than that quickly results in personal judgments. JBJ may not have been a lock-down perimeter defender, but as we have seen abundantly, his absence has not made our defense better. What is has done is make our offense worse. I’d take him back in a heartbeat if it were possible. block the shot? Not quite sure but isn’t that how JM hurt his ankle? Would like to see them just turn and block out and rebound a possible miss. short. Would like to see him make adjustments during the game. At least you didn’t spend hundreds on Duke tickets. I’ll still be going, and root the guys on…but man I bet I could get them cheaper now! Not even going to look. I disagree just a little bit on RJ. He had a good second half. I have to catch myself and not automatically lump him in with JN’s poor play. I agree. I mentioned the same thing in a thread. Injuries change people. Another one ’90s Bobby ran off. Vic and Puddlington (I just have to throw in the “l” it’s just not the King’s English vibe without it), longtime lurker first time caller but I’ve always been impressed with your stuff. Fabulous. No need for negativity after the Boeheim Debacle so I held my tongue until now.